I've recently been introduced to this lovely dish, originated from the city of Hue. My parents never had this dish while they were in Vietnam, which led to my late meeting with this dish as well. It's crazy how vast the Vietnamese cuisine is for my parents in their 60's have not had this dish. Being from the North and migrated to the South when they were very young may have an impact. I am truly overjoyed that we have finally met because I know we will be friends for a very long time. 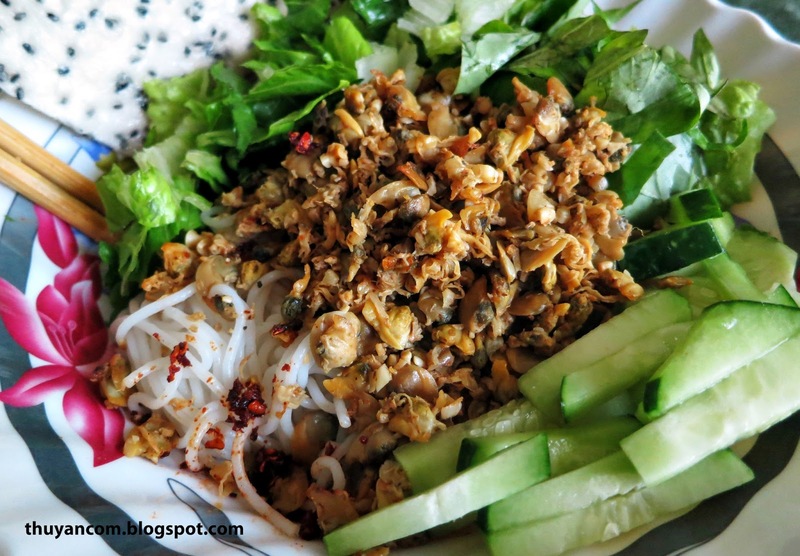 This dish can be eaten with rice noodles or rice, but I always prefer noodles over rice. In Vietnam, the baby clams are picked right out of the freshwater and steamed with lemongrass. I can imagine how fragrance and fresh the baby clams taste. Unfortunately, we do not have that luxury here in the States, often have to settle for canned our frozen clams. Even so, I still love eating Bun Hen. I love that this dish requires fresh vegetables and herb, and can be eaten with sesame rice cracker. The clams is sauteed and seasoned with shallots, garlic, and black peppers. Like most bun dish, there needs to be a sauce. It's not he limey fish sauce that we have become familiar with. For this dish, we make the sauce from fermented fish paste (mam ruot) and the clam juice. The sauce is salty and pungent, but is needed to bring this dish together. I've tasted Bun Hen made by different people, and there are certainly some differences. Some seasoned the clams a lot more and some makes a lighter sauce than others. But no matter how different each Bun Hen taste, the one thing that makes the dish so delicious is the vegetables and herbs. I always tell people that herbs is an essential ingredient to Vietnamese cuisine. I cannot claim that this recipe is authentic, but this what I have come up with after tasting different Bun Hen. Perfect dish for the summertime, enjoy! 1. Cook the vermicelli rice noodles and let it dry. If you are using rice, cook the rice a little bit dryer than usually. Mushy rice will ruin this dish. 2. Open the canned clams and drained the liquid, setting the liquid aside to make sauce. 3. Washed all the vegetables and herbs, and let dry. The lettuce and herbs should be chopped for easier eating. You can mixed the two together as well. 4. In a pan, heat up about two tablespoon of cooking oil. Add 1/2 of the shallot and garlic and cook until fragrance. Add the baby clams to the pan and sauteed together with the shallot and garlic. Seasoned the clams lightly with some of salt, sugar, black pepper and chili powder. I like to eat spicy food, therefore you can omit the chili powder if you do not like spicy food. Continue to cook this mixture, and if like it a little burned you can cook the clams a little longer. 5. In a small pot, heat up two table spoon of cooking oil. Add the remaining garlic and shallots and sauteed until fragrance. Add the juice of the canned clams (about 2 cups) to the pot, and then stir in 4-5 tablespoon of fermented fish paste. I added 2 tablespoon of chili powder for spiciness. Once the sauce has come to a boil, turn off the heat. 6. In a bowl, add rice noodles, vegetables, cucumber and herbs. Scoop however much of the sauteed clams you want on top. Add some sesame rice cracker and then add sauce to your liking. You can cut in additional chili if you like it really spicy. Mix everything together and enjoy! I can't wait to try this =) Are you using canned clams from a certain Asian brand deliberately or b/c there isn't any in your area. I ask because usually the clams I have here (in handfuls and shelled) are defrosted and have very little flavor. I was looking for this dish when I was in Vietnam last year, but could not find anywhere that sold it on the street. I then had it in a restaurant in HCMC, but was a little bit disappointed. I had high hopes for the sweet and salty flavour combination, but their version seemed bland. Thank you for sharing the recipe, I will definitely try this out.